We told you all about our star David, and his long and often difficult battle after a road traffic incident over 10 years ago. We are delighted to report that this week David finally got the key to the door of his new home – and we could not be more delighted! After a proper tussle with residential care, social services and funding, David finally moved in this weekend and starts his new life within a shared lives placement through the Avalon Group. 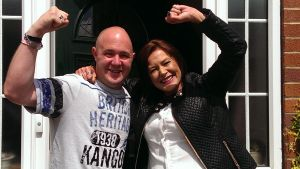 David is now living with care and support provider Anita, her family and another client. And the photos tell you everything about how fabulous that feels! 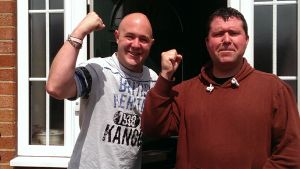 David is pictured with his support worker Dave who has been there alongside and will continue to support David in his new home. Also raising a hand of celebration is Jo – David’s Case Manager who has fought his corner to secure this placement when all looked irredeemable. 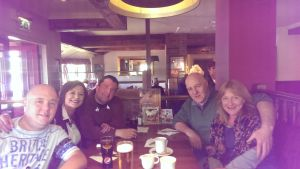 And finally the whole ‘family’ enjoy a well deserved drink and a pie in the pub – fantastic work from the AKA team – a brilliant job by David – and now we are sharing the love with Anita and her family.